There is probably nothing more relaxing and calming than taking a stroll in a park in the afternoon or after a long day of school or work. In Japan, there are several parks that one can visit when one wants to unwind and relax. Throughout the country, there are several parks and gardens that were built for the purpose of relaxation and recreation. A famous park that one can check out when one is in Tokyo would definitely be Hibiya Park. More commonly known as Hibiya Koen in Japanese, Hibiya Park is located in the city of Chiyoda in Tokyo, Japan. With an area of 161,636.66 square meters, Hibiya Park covers the space between the east gardens of the Imperial Palace on the northern side, the Kasumigaseki government district on the western side, and the Shinbashi district on the southeastern side. The most famous attraction in Hibiya Park would probably be none other than the Shisei Kaikan. The Shisei Kaikan is a brick building constructed in the year 1929. It follows a Gothic style and once served as the home of the Domei Tsushin state wire service. Its successors after the war, Kyodo News and Jiji Press, also used to reside in the Shisei Kaikan. Hibiya Park also houses an open-air concert venue called the Hibiya Open-Air Concert Hall. Several concerts have been held in this hall. The tennis courts of Hibiya Park are also quite well-known. Because of its proximity to government and financial districts, the reservation of these tennis courts sells out fast. Two huge Western-style flower gardens can be found in Hibiya Park. One flower garden is composed mainly of tulips while the other consists mainly of roses. These gardens are quite a beauty during the blossoming season. Surrounding the park are several restaurants and shops that offer refreshments for passers-by. 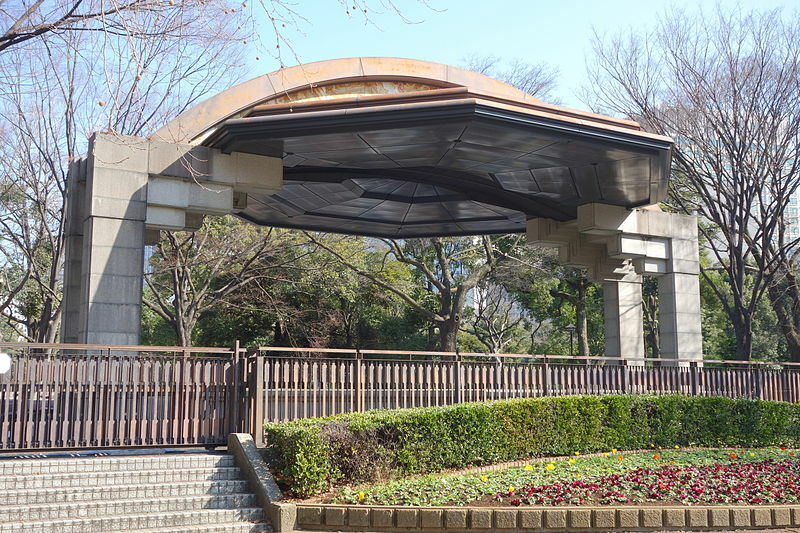 With two outdoor music domes, Hibiya Park is often visited by music enthusiasts. Several musical performances can be seen and heard in Hibiya Park, especially on weekends. Sometimes, even festivals are held at Hibiya Park. The two music domes are composed of a large one and a small one. Aside from the domes, the park also consists of a Park Museum, a public hall, and the Hibiya Library. There is also a wide range of trees in Hibiya Park that one can check out. Probably the most famous one is the Ginkgo biloba, also known as maidenhair trees. These trees form an avenue at the center of Hibiya Park. The best part of the avenue is the Kubikake-itcho. 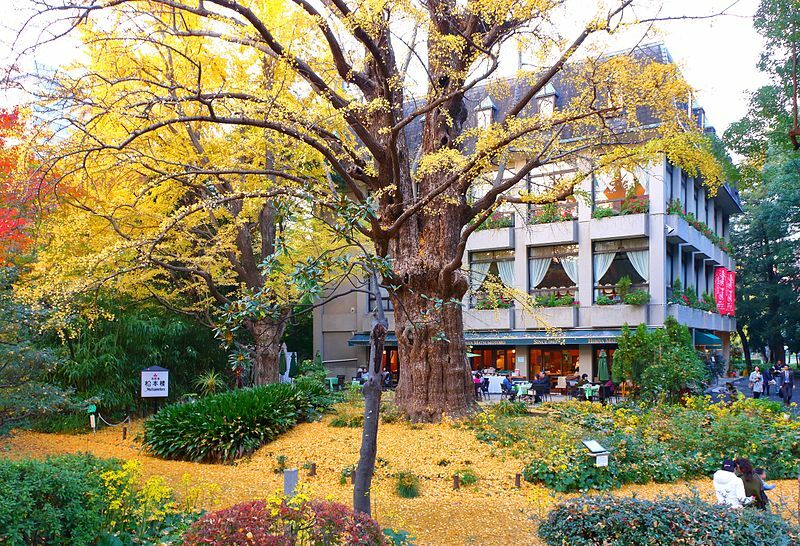 Standing right next to the Matsumotoro Restaurant, the Kubikake-itcho is a gigantic ginkgo. Around 400 years old, this tree has a height of 24.5 meters, which is equivalent to 80 feet, and a circumference of 6.5 meters, which is equivalent to 21 feet. Its original location was 450 meters, which is equivalent to 0.3 miles, away from its current position. It took almost a month to move the tree from its former location to Hibiya Park in the year 1988. Its nickname “Kubikake,” means “to put one’s neck on the line” in Japanese. It refers to the chief designer of the park, Dr. Seiroku Honda, who risked his career just to save this tree. In total, Hibiya Park has 3,100 tall trees with 10,100 square meters of shrubs and 11,300 square meters of grass. The main plants in the garden include Ginkgo, camphor, dogwood, tulip tree, leopard plant, Japanese apricot, buttonball, pine, and rose. Usual events that are held in the park include concerts at the small music hall every Wednesday and Friday, seedling sale in April and October, morning glory display in July, and chrysanthemum display in November. A nice feature of the park is the pond that goes back to the year 1905. The pond consists of a bronze crane fountain. There are times when live cranes can be found in the pond, which depicts a homey scene. Several mementos from other countries can also be found in the park. These include stone money from Yap Island, a Viking stone epitaph, a block of gneiss from Antarctica, and a statue from Italy. Hibiya Park is open for 24 hours a day, 7 days a week. It does not close even on holidays. Admission is also free of charge. 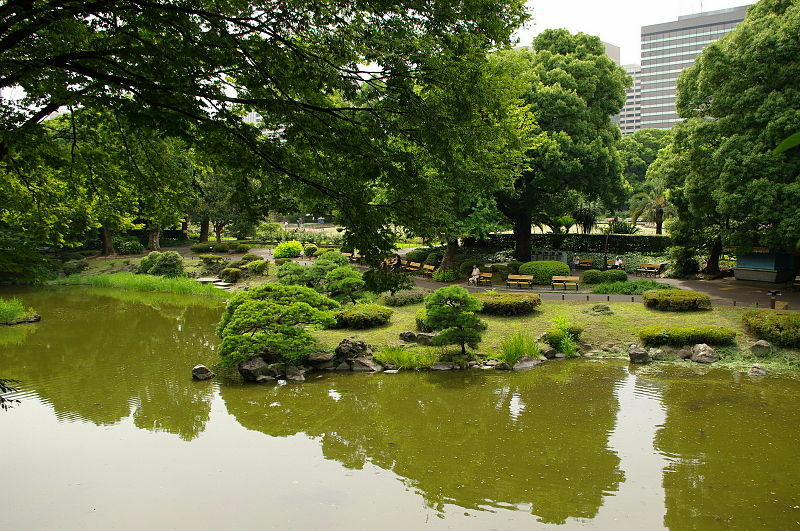 Hence, anyone and everyone can visit Hibiya Park and enjoy its lovely scenery. The park is also quite accessible. Guests can go to Exit B2 from Kasumigaseki Station, to Exit B2 from Yurakucho Station, or to Exits A10 or A14 from Hibiya Station. Hibiya Park also has its own rich history. The land where it sits used to be part of the property of the Mori clan and the Nabeshima clan during the Edo era. Come the Meiji period, the land was utilized for army maneuvers. On the 1st of June in the year 1903, the land was finally converted to a park to be enjoyed by the public. Several incidents took place in Hibiya Park after it opened. First, it was the place where the Hibiya Riots were initiated in the year 1905. It was a famous protest composed of 30,000 people who were against the terms of the Portsmouth Treaty. It was the peace treaty between Japan, the victorious of the battle, and Russia, the defeated party, that was brokered by the US. This riot was known as the Hibiya Incendiary Incident. It occurred on the 5th of September in the year 1905. The people rebelled against the treaty, with the idea that the treaty was actually a sell-out. The riot spread over Tokyo, destroying almost every police box known as koban in the city. Hundreds of people were injured and 17 people were killed. A newspaper company known to be for the treaty got its offices burned down. Due to the chaos, martial law had to be imposed for more than 2 months. Nonetheless, these riots showed the birth of nationalism in Japan. Today, Hibiya Park represents peace, serenity, music, and happiness. There are several events that are held in Hibiya Park every year. These events are attended by hundreds of people wanting to participate in the festivities. One of the most awaited events to be held in Hibiya Park is the Hibiya Oktoberfest. This year, the Hibiya Oktoberfest is to be held in Hibiya Park some time in mid-September. While the date is not yet confirmed, people are already planning on attending the event. The festival would be a celebration of German culture. It would feature food, dance, music, and, of course, beer. Another event held in Hibiya Park is the Tokyo Marathon. Held on the 25th of February, Hibiya Park serves as the finish line for the 10-kilometer run of the Tokyo Marathon. As there are music halls and concert grounds in Hibiya Park, it is only natural to hold concerts and musical events in the area. Two stages of the park are used as venues for several concerts every year. These stages come with permanent seating. The stages are to be reserved with the approval of the local city hall of Chiyoda-ku. These events usually take place in months of good weather. Because there is a wedding chapel located at the center of the park, some couples also get married in Hibiya Park. A French restaurant also stands nearby, which works great as a reception of some sort for the wedded couples. As for recreation, tennis courts in Hibiya Park can be reserved. However, due to the rarity of tennis courts in central Tokyo, one would need to find some connections in order to be able to book a court. One of the biggest festivals to be held in Hibiya Park is the Hibiya Park Marunouchi Ondo Bon-odori Festival. Held in late August, this festival is one of the biggest, as well as most accessible, Bon-odori festivals in all of Tokyo. Participants in the festival include an estimated 40,000 employees of businesses that can be found in the Marunouchi area. Performances include dancing to the Marunouchi song while circling around the fountain in Hibiya Park. Another anticipated event to be held in Hibiya Park this year is the Hibeer Garden. It is the largest, as well as the frothiest, beer garden in the country. Just last year, the event garnered more than 100,000 visitors. This year, Hibeer Garden would be held in Hibiya Park from 18th to 27th of May. A wide range of brews from different parts of the world would be offered in the event, including beers from Belgium, Scotland, France, Czech Republic, Ireland, the US, and, of course, Japan. Aside from the drinks, foods from these countries would also be offered in the events. These include meat, vegetables, seafood, and different kinds of cheese. While enjoying the dishes served in the event, guests can also watch live performances of music from around the world. The event would be from 2 AM until 10:30 PM on weekdays and from 11 AM to 10:30 PM on weekends. Admission to the event is free of charge. There are several features of Hibiya Park that make it an overall attractive place to visit. For one, Hibiya Park houses several dozens of sakura trees that bloom so beautifully during the spring season. Upon its bloom, visitors can have a small hanami party in the area, enjoying the view of the cherry blossoms while drinking tea and eating Japanese sweets. Visitors can also go for a stroll while several sakura flowers and its petals fall from the trees. Numerous odd statues can also be found on the grounds of Hibiya Park. Most of these statues were donated by governments of other countries. Despite its randomness, these statues provide a sense of eccentricity to the place. One of the most well-known statues in the park is the Lupa Romana statue. A present from Italy in the year 1938, the statue depicts two brothers, Remus and Romulus, who, according to Roman myth, were raised by wolves. One of the attractions of the park is its fountain. The Park Fountain serves as the symbol of Hibiya Park. With a diameter of 30 meters, the fountain spews water that reaches as high as 12 meters. On a particularly hot day, standing near the fountain can be quite refreshing. Next to the fountain is the Shinji Pond. Several animals fly to the pond, including small egrets, ducks, herons, and other wild birds. 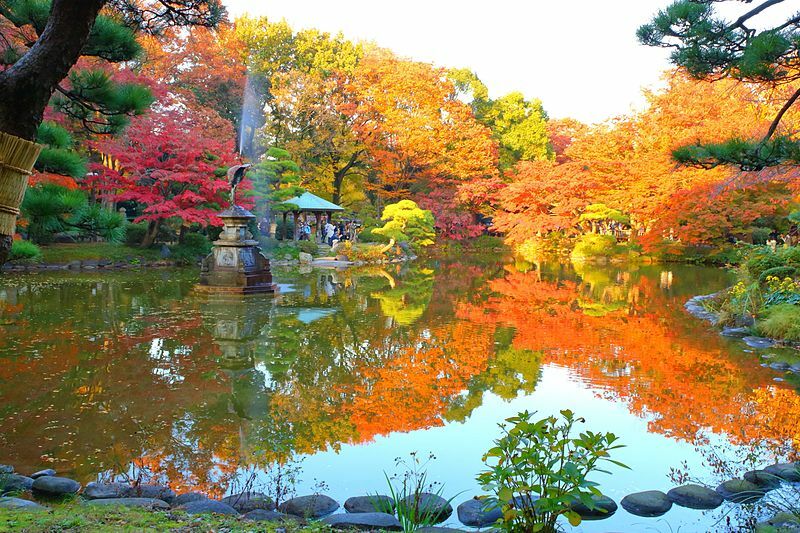 Hibiya Park is a pretty sight not just during the spring season but also during the fall season. With more than 3,000 trees, the park creates a beautiful, vibrant picture during the autumn season. The park houses 51 types of trees, which were donations from each prefecture of the country. The leaves turn into hues of red and orange during the fall season, which many visitors find attractive and visit during that time of the year. The first Western-style flower gardens in the country can also be found in Hibiya Park. These gardens are still maintained up to this day. Several types of flowers are maintained in the park so that at least one type of flower is in bloom every month. A walking path known as the Green Path can also be found in the park, wherein the path forms beautiful green tunnels. Hibiya Park also features what is called Health Field. With an area of 2,200 square meters, the Health Field has equipment that can be utilized to measure strength. The area is also commonly used for physical training. It is typical to find people from the business district to stop at the Health Field to try some exercises. After all, Hibiya Park is close to business offices such as the Hibiya Park Law Offices. With so much to explore in Hibiya Park, it comes as no surprise that locals and even tourists often visit the park. It is not only beautiful to look at because of its gardens and facilities but also a part of the history of Japan. If one ever finds one’s self in the city of Chiyoda, definitely check out and discover the beauty of Hibiya Park.